I like making things from scratch: bread with sourdough, mayonnaise, vegetable stock….everything! Many of the expensive flavored salts that you find at the store can easily be made at home at a much lower cost. 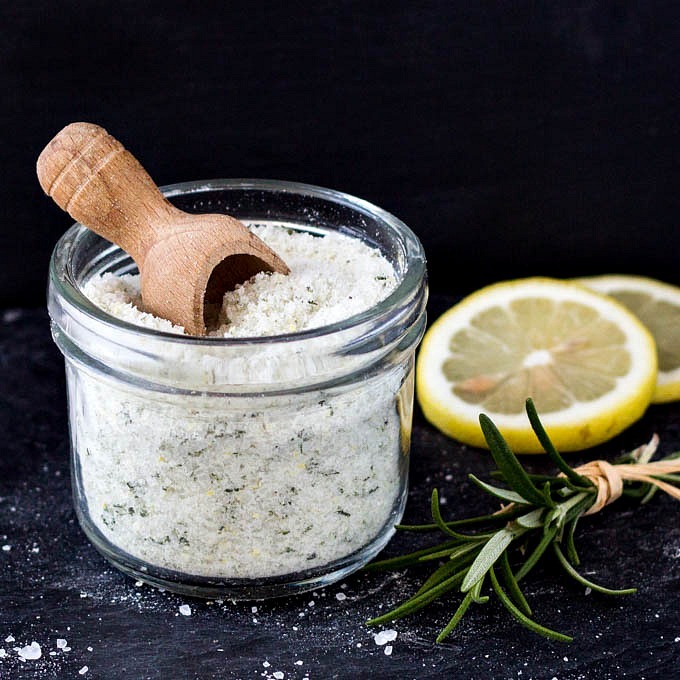 Rosemary-lemon sea salt makes a wonderful addition to the kitchen as it can boost the flavor of any dish. It’s surprisingly simple to make. Combine the coarse sea salt, fresh rosemary and lemon zest in a food processor and pulse. Then spread the mixture on a baking sheet and let it dry in the oven. Transfer the rosemary lemon sea salt in an airtight container or in a glass jar with a tight-fitting lid. You can customize the infused salt to suit your personal taste. If rosemary is not your favorite herb try basil, thyme or sage. 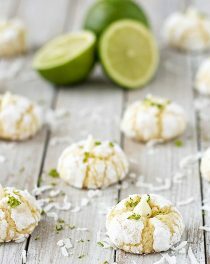 Replace the lemon zest with orange zest or mandarin. Add some spices, lavender or black peppercorn. It’s entirely up to you. Flavored salts make unique and lovely gifts for your friends or relatives. Just put it in a small glass jar with a ribbon and a tag with serving ideas. 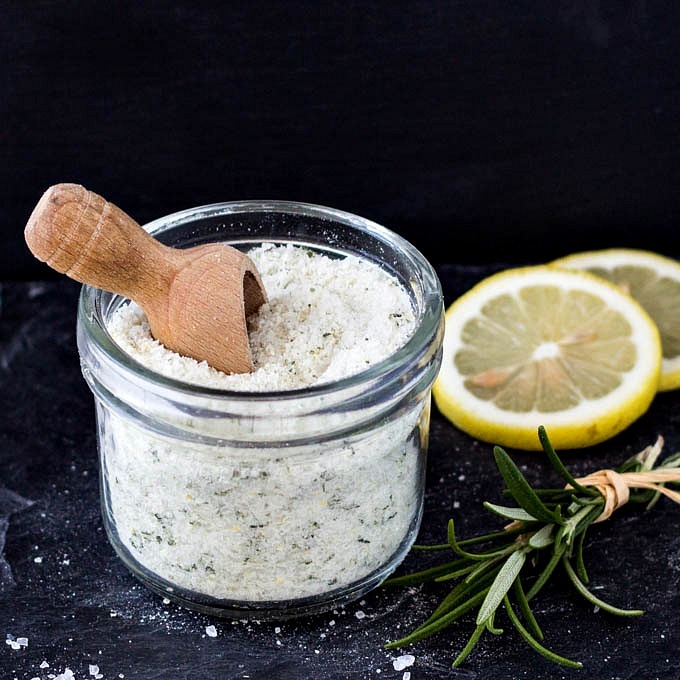 How can you use the rosemary-lemon sea salt? 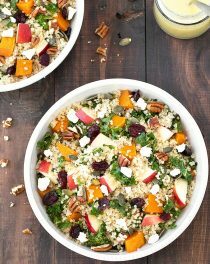 Sprinkle it over grilled meat, popcorn, homemade potato chips, fish, roasted or baked chicken, roasted vegetables, baked potatoes, focaccia, etc. It’s super versatile!!! What is your favorite infused sea salt flavor? 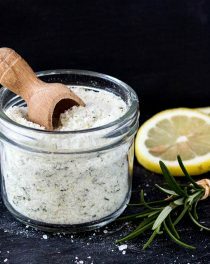 Rosemary-Lemon Sea Salt makes a wonderful addition to the kitchen as it can boost the flavor of any dish. 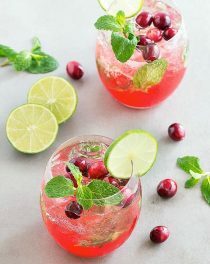 DIY flavored salts make unique and lovely gifts for friends and family. Zest the lemon and finely chop the rosemary (leaves only, discard the stem). Add the sea salt, rosemary and lemon zest to a food processor. Pulse until the salt becomes a little finer and everything is well mixed. Taste and increase the amount of flavorings, if desired. Transfer the mixture to a baking sheet and bake for 15-20 minutes. Remove it from the oven and, if there are any lumps, pulse it in the food processor again. Let it cool for 5 minutes and store the rosemary-lemon sea salt in an airtight container or in a glass jar with a tight-fitting lid. Ideally, let it sit at least a day before using. The intensity of flavor will diminish over time, but it can last up to a year. Thanks for this recipe. I use regular sea salt, but, I think your sea salt recipe is much more exciting.